Sanjay Leela Bhansali’s directorial ‘Padmaavat’ starring Deepika Padukone, Shahid Kapoor and Ranveer Singh, released in cinemas worldwide on 25th January 2018. Based on 16th century Sufi poet Malik Muhammad Jayasi’s epic poem Padmavat, Padmaavat showcases the valor of Rani Padmavati, Maharawal Ratan Singh and the famed Rajput ethos of honour, bravery and sacrifice. The blockbuster film was well received across international markets, ranking as the number three film globally over the past weekend and breaking into the top 10 UK Box Office charts. The film received a 4 star review from British newspaper The Guardian, where it was described as a ‘gloriously stirring spectacle’. We loved here at BollySpice giving the film 5 stars! With this positive reception, ‘Padmaavat’ is already setting new records at the international box-office records amidst equally great reviews from audience and critics alike. After the opening weekend, a new song from Padmaavat featuring Ranveer Singh who plays the role of Sultan Alauddin Khilji has also been released – KhaliBali sung by Shivam Pathak with music by Sanjay Leela Bhansali and lyrics by A M Turaz . 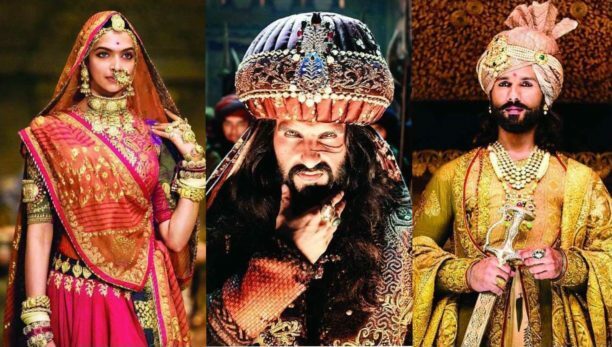 Directed by Sanjay Leela Bhansali, ‘Padmaavat’ stars Deepika Padukone as Rani Padmavati, Shahid Kapoor as Maharawal Ratan Singh & Ranveer Singh as Sultan Alauddin Khilji. Set in 1303 AD medieval India, Padmaavat is the story of honour, valour and obsession. Queen Padmavati is known for her exceptional beauty along with a strong sense of justice and is the wife of Maharawal Ratan Singh and pride of the Kingdom of Chittor, a prosperous kingdom in the north west of India. The legend of her beauty reaches the reigning sultan of Hindustan – Allaudin Khilji. The sultan who is a tyrant, is fixated with wanting anything that is of exceptional beauty for himself. He lays siege on the impregnable fortress of Chittorgarh. After a gruelling 6 months, he returns empty handed. He becomes obsessed and now wants to capture Chittor and its Queen at any cost. He returns with a bigger army and ranging fury. He attacks Chittor with brutal force and a bloody and fearsome battle takes places between the righteous Maharawal Ratan Singh defending his kingdom and the honour of his queen and Sultan Allaudin Khilji. Khilji manages to breach the fortress but in vain as the Queen chooses to make the ultimate sacrifice to protect her dignity. Padmaavat is out now at your nearest cinema!